I tend to be leaving my daily project later and later in the day. Tonight I was getting a little desperate as took the dogs out at 8.30pm and was thinking, what the heck can I take a photo of? I liked the lights on our tree but had already shot these before, so I thought I would do a Bokeh type effect, but that didn’t work. I suddenly spotted the daffodils at the bottom of tree and got the idea. Got in really close, and so lights are out of focus and create Bokeh look. 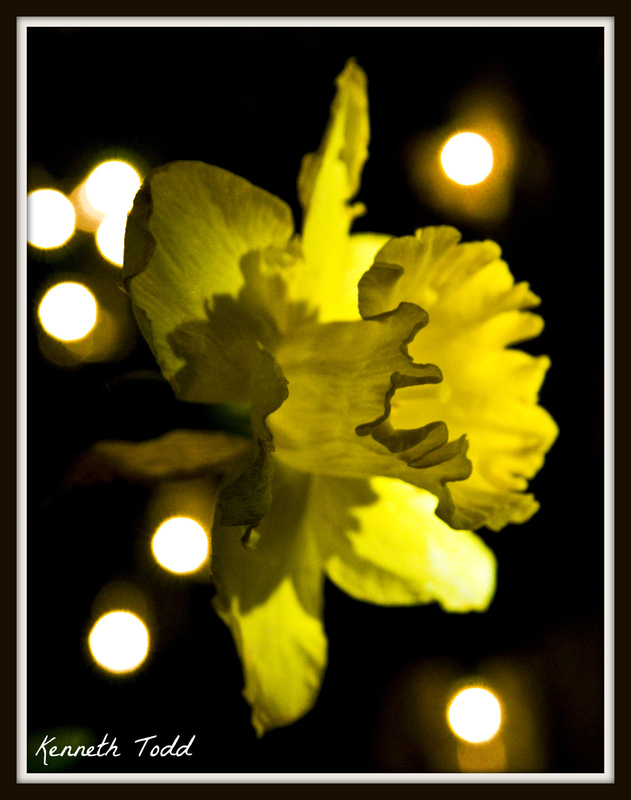 I then used a handheld flash light and “painted” the daffodil using quick up and down motions. I quite like the end result. So from inception to posting is only 45 mins. So I was very thankful for that idea and I know it doesn’t come from me. After all where do thoughts come from? Can I actually own a thought? I like the light in this picture! You’re quick! Love the illumination effect of the flower and the bokeh. Very pretty! Another one that is most creative and I love the color. Nicely done. I really like the way you painted in the daffodil. I’ll have to say, you’re downright handy with a flashlight! This is nice. A really unusual shot of a daffodil—I like it a lot. I look forward to exploring more of your site.